Nuclear Power: a Possible Solution for Global Warming. Really??? 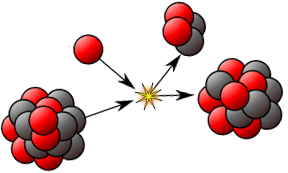 nuclear fission is a process in which the nucleus of an atom splits into smaller parts. The fission process often produces free neutrons and photons (in the form of gamma rays), and releases a very large amount of energy even by the energetic standards of radioactive decay. The products of nuclear fission are on average far more radioactive than the heavy elements which are normally fissioned as fuel (for example Uranium), and remain so for significant amounts of time. Thus, is it nuclear energy safe? The world had 434 operable reactors with 66 others currently under construction. Statistically, considering the number of reactors and number of accidents, nuclear power plants are not really unsafe. Well, statistics is powerful and should be used carefully. Each nuclear accident could represent environmental concerns of hundreds of years (maybe thousands depending of the element and nuclear decay process). Therefore, only one accident can lead to catastrophic environmental consequences. I started watching a movie about the Chernobyl accident and then I found more documentaries including nuclear power accidents, nuclear footprints and nuclear waste. It was an amazing journey. I hope these movies help you to understand more about this technology which is amazing but at the same time scary. Personally, after all these movies I though: “Wow, coal energy is kind of cleaner when compared to nuclear energy.”. It is important to mention there is a debate about the use of Thorium instead of Uranium or Plutonium in the nuclear power plants. The claim is that Thorium is cheaper, safer and also abundant. Well, soon we will see the reality of these claims. This wasn’t the first movie that I saw about the topic but it was the most impressive for me. It was for me the scariest because of the time-dimension of the problem and the solution. 100,000 years. Wow, 100,000 years! Every day, the world over, large amounts of high-level radioactive waste created by nuclear power plants is placed in interim storages, which are vulnerable to natural disasters, man-made disasters, and to societal changes. In Finland the world’s first permanent repository is being hewn out of solid rock – a huge system of underground tunnels – that must last 100,000 years as this is how long the waste remains hazardous. Once the waste has been deposited and the repository is full, the facility is to be sealed off and never opened again. Or so we hope, but can we ensure that? And how is it possible to warn our descendants of the deadly waste we left behind? How do we prevent them from thinking they have found the pyramids of our time, mystical burial grounds, hidden treasures? Which languages and signs will they understand? And if they understand, will they respect our instructions? While gigantic monster machines dig deeper and deeper into the dark, experts above ground strive to find solutions to this crucially important radioactive waste issue to secure mankind and all species on planet Earth now and in the near and very distant future. Three Mile Island, Chernobyl and Fukushima: This original Earth Focus investigative report looks at the untold stories behind three of the world’s largest nuclear disasters. This documentary analyzes the Thursday 26th April 1986 when one of the reactors at the Chernobyl nuclear power station in northern Ukraine, exploded. The plant, just 20 km away from the town centre, was made up of four reactor units each generating an output of 1,000 megawatts. The reactor in question exploded due to operational errors and inadequate safety measures and the meltdown was directly linked to routine testing on the reactor unit’s turbine generators. This is a documentary that takes a look at the footprints of nuclear energy. In Europe nuclear energy is more and more often celebrated as saving the climate. Clearly, nuclear power plants need uranium. The aim is to comprehensively illustrate the opportunities and risks posed by nuclear energy, whilst paying particular attention to uranium mining. Australia has the world’s largest deposits of this resource. They go to the “land down under” to exemplify where uranium comes from, where it goes to and what is leftover from it. Examines the incident, aftermath and implications for the adoption of Nuclear energy in other countries. From ‘Four Corners’, an Australian investigative program on the ABC.